Taking a stroll down the toothbrush aisle in the grocery store or pharmacy can be overwhelming at best! Extra-soft, soft, medium, hard and even electric toothbrush options make choosing the right toothbrush feel like the most difficult decision since buying your first car! If you know what to look for, you won’t feel trapped by your decisions and can make a beeline to the check-out counter and feel confident that you are choosing the right toothbrush! The first rule in choosing the right toothbrush is to always choose soft or extra soft bristles. This type of toothbrush is the best for an adult or child. Hard bristles may do damage to your gum tissue by pulling it back from your teeth, exposing the root of a tooth and causing increased sensitivity to cold, heat or certain foods and drinks. For an adult, choose a toothbrush head size that fits comfortably into your mouth and can brush up to 2 teeth at a time. The usual head size is about 1 inch long and 1/2 inch wide. When choosing a toothbrush for a child, make sure it has a very small head designed for baby teeth. If the toothbrush bears the American Dental Association Seal of Acceptance, this means that it has passed rigorous testing that proves it is safe and effective. The proper way to brush your teeth is by holding your toothbrush at a 45 degree angle at the gumline with the bristles slightly under the gums. Use light pressure and circular or short back and forth strokes while brushing the surface of each tooth. You should brush for 2 minutes while being careful not to scrub vigorously, as this can wear the enamel off your teeth. Only brush hard enough to remove the film from your teeth and tongue, avoiding abrasion. If you have braces or are a senior citizen with limited mobility or arthritis, a soft-bristled rotating-oscillating electric toothbrush is probably your best choice. In these cases, it is very difficult to remove all the plaque and food particles with a manual toothbrush. The American Dental Association (ADA) recommends that you replace your toothbrush approximately every three to four months or sooner if the bristles are frayed. Studies show that old toothbrushes with signs of wear and tear are much less effective at removing plaque from teeth and gums compared to new ones. If you have been sick with a virus or the flu, it is a good idea to replace your toothbrush sooner, because there are germs hiding in toothbrush bristles that can lead to reinfection. Soak your toothbrush in antibacterial mouthwash for at least 20 minutes. Rinse thoroughly with hot water before using it again. Vinegar is a good choice for soaking your toothbrush overnight to kill germs. Just be sure to rinse thoroughly with very warm water, as vinegar is very acidic and could be rough on your enamel if you do not rinse carefully. Hydrogen peroxide works great for every day cleaning. Store your toothbrush in a small cup of hydrogen peroxide and rinse in hot water before using it again. Every time you brush your teeth, change out the hydrogen peroxide. Place your toothbrush in boiling water for about 3 minutes. Although this can cause your toothbrush to break down faster, boiling water will kill most germs. You can sanitize your toothbrush by placing it in the dishwasher and running it through on the hot cycle. UV toothbrush sanitizers can also effectively kill most bacteria on your toothbrush. They are convenient and provide a great way to store your toothbrush. Microwaving your toothbrush for just one minute can completely eradicate bacteria. Be sure to wait for the handle to cool off before removing it from your oven. Your mouth is home to millions of bacteria, so cleaning your toothbrush should be an important part of your daily routine. 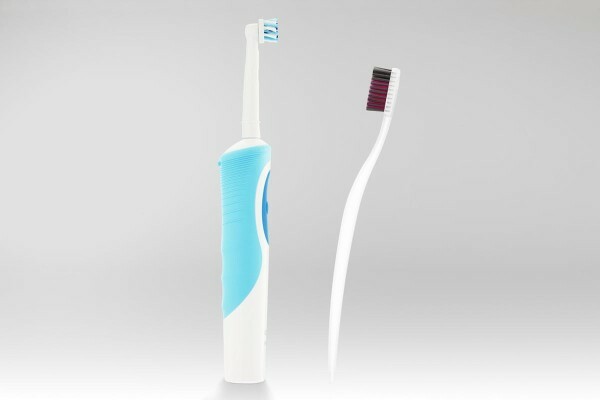 Electric toothbrushes have replaceable heads and can be cleaned and disinfected in the same way as a manual toothbrush. At Good Samaritan Dental Implant Institute, your smile is important to us! Knowing how to choose, use and care for your toothbrush are important aspects of good oral hygiene.